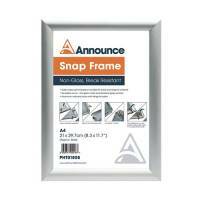 Bi-Office Snap Frame A4 Aluminium Frame VT720415370 Pack of 1 Bi-Office Snap Frame A4 Aluminium Frame VT720415370. Aluminium frame snaps open for changing contents quickly. Clear plastic cover protects contents. Supplied with wall fixing kit. 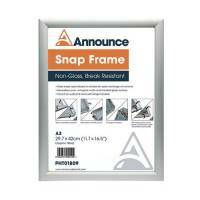 Bi-Office Snap Frame A3 Aluminium Frame VT560415370 Pack of 1 Bi-Office Snap Frame A3 Aluminium Frame VT560415370. Aluminium frame snaps open for changing contents quickly. Clear plastic cover protects contents. Supplied with wall fixing kit. 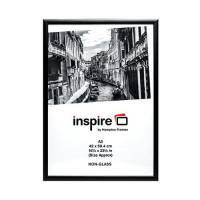 Nobo Aluminium A4 Silver Clipframe 1902214 Pack of 1 "A4 Clip frame with Aluminium Frame provides easy access to posters, memos, notices etc. to allow them to be changed without removing the frame from the wall. Simply lift up the edges, remove the protection sheet and insert your poster. Fixings supplied." 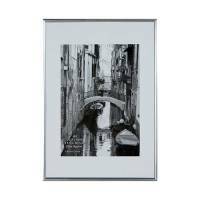 Nobo Aluminium A3 Silver Clipframe 1902213 Pack of 1 A3 clip frame with anodised aluminium frame. Opens at the front to allow picture to be changed. 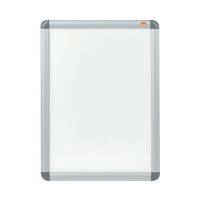 Anti-glare PVC cover protects posters from dust and weather-seal protects posters if used outside. Supplied with wall fixings. Photo Album Company A1 Signature Styrene Frameless Frame CF5984NG Pack of 1 The Photo Album Company Frameless Frames. 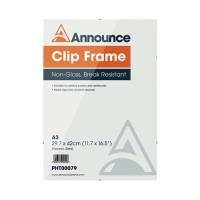 Top quality clip frames with styrene face complete with metal clips. Individually packed and shrink-wrapped with protective corners. A1. 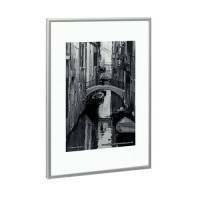 Photo Album Company A3 Signature Styrene Frameless Frame CF3042NG Pack of 1 The Photo Album Company Frameless Frames. 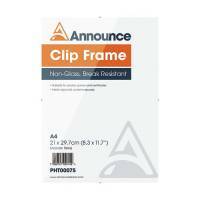 Top quality clip frames with styrene face complete with metal clips. Individually packed and shrink-wrapped with protective corners Size: A3 (420x300mm). Photo Album Company A4 Signature Styrene Frameless Frame CF2130NG Pack of 1 The Photo Album Company Frameless Frames. 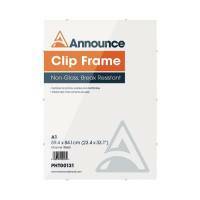 Top quality clip frames with styrene face complete with metal clips. Individually packed and shrink-wrapped with protective corners. Size: A4 (210x300mm). Photo Album Company A2 Signature Styrene Frameless Frame CF4259NG Pack of 1 The Photo Album Company Frameless Frames. Top quality clip frames with styrene face complete with metal clips. Individually packed and shrink-wrapped with protective corners. Size A2. 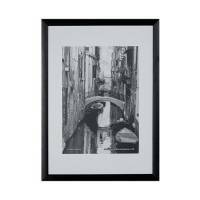 Photo Album Co Backloader Black A3 Non Glass A3MARBL Pack of 1 A3 certificate frame with non glass perspex front. Quick loading spring clipped back. 10mm black plastic moulding. Facepaper with black border ideal for A4 certificates or photographs. Wall mounting only. 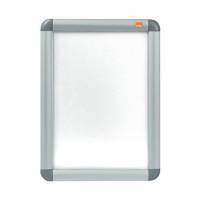 Photo Album Co Backloader Silver A3 Non Glass A3MARSIL Pack of 1 A3 certificate frame with non glass perspex front. Quick loading spring clipped back. 10mm silver plastic moulding. Facepaper with black border ideal for A4 certificates or photographs. Wall mounting only. Photo Album Co Backloader A4 Black Glass BLRA4BK Pack of 1 A4 certificate frame with glass front. Quick loading spring clipped back. 9mm black plastic moulding. Can be displayed either portrait or landscape. Photo Album Co Backloader A4 Silver Glass BLRA4SV Pack of 1 A4 certificate frame with glass front. Quick loading spring clipped back. 9mm silver plastic moulding. Can be displayed either portrait or landscape. Photo Album Co A2 Black Wood Frame Non-Glass PAWFA2BBLK Pack of 1 A2 certificate frame with non glass perspex front. 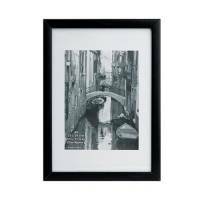 Wooden frame with 22mm moulding. Can be displayed either portrait or landscape. Wall mounting only. Photo Album Co A1 Black Wood Frame Non Glass PAWFA1BBLK Pack of 1 A1 certificate frame with non glass perspex front. Wooden frame with 22mm moulding. Can be displayed either portrait or landscape. Wall mounting only. Photo Album Co Black Wood Certificate Frame Glass KENTA4GL Pack of 1 A4 certificate frame with glass front. 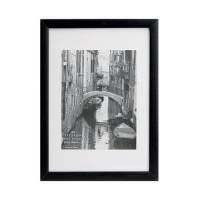 Black wooden frame. Can be displayed either portrait or landscape. 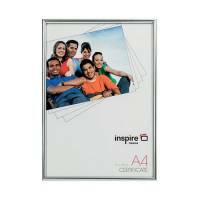 Photo Album Co Aluminium Certificate Frame A4 Non Glass AL19A4NG Pack of 1 A4 certificate frame with non glass front. Aluminium frame. Can be displayed either portrait or landscape. Photo Album Company Brushed Aluminium A4 Certificate Frame PAAFA4B Pack of 1 "The Photo Album Company Aluminium Frame. Brushed aluminium frame and glass front ideal for displaying photographs, certificates and posters. Size: A4 (210x300mm)." Photo Album Company Brushed Aluminium A3 Certificate Frame PAAFA3B Pack of 1 "The Photo Album Company Aluminium Frame. Brushed aluminium frame and safe styrene front ideal for displaying photographs, certificates and posters. Size: A3 (420x300mm)." Photo Album Company Black A4 Wooden Frame PAWFA4B-BLK Pack of 1 "Certificate Frame. 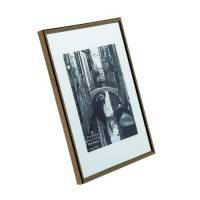 Smart frame with a wooden surround and break resistant clear front. Easy to use, simply bend back metal clips, insert your picture, certificate etc. and bend the metal clips back into place. Size - A4. Frame Colour - Black." Photo Album Company Metal A4 Black /Gold Certificate Frame PACFA4B Pack of 1 "The Photo Album Company Certificate Frames. 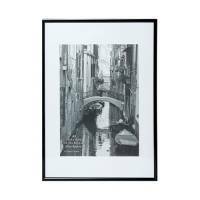 High quality, A4, certificate frames with a Black/Gold frame." 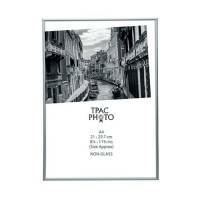 Photo Album Company Brushed Aluminium A2 Certificate Frame PAAFA2B Pack of 1 "The Photo Album Company Aluminium Frame. 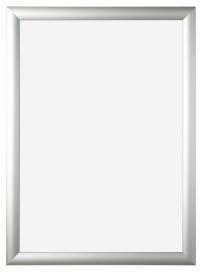 Brushed aluminium frame and safe styrene front ideal for displaying photographs, certificates and posters. Size: A2 (600x420mm)."